The day before the start of this summer's special legislative session, educator groups rallied at the Texas Capitol, demanding more state resources and fewer unfunded mandates. 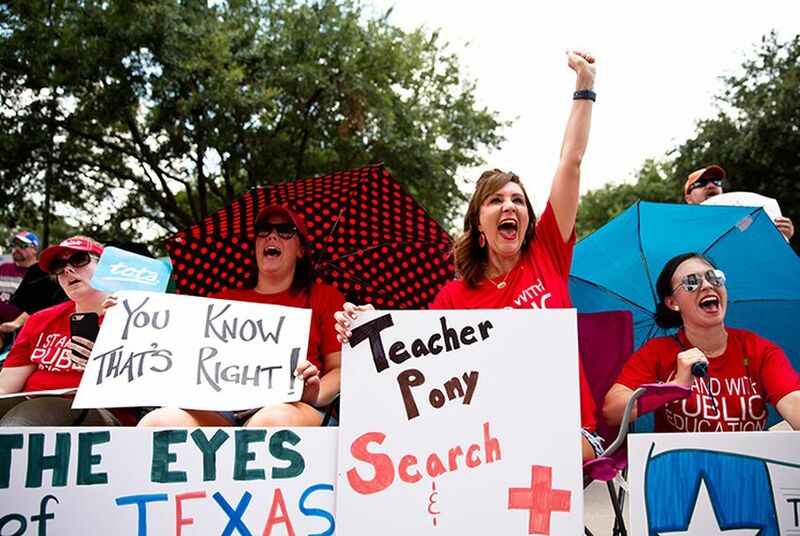 The day before the start of Texas' special legislative session, teachers and educator groups flooded the south lawn of the state Capitol to stand against the governor's schools agenda. Their message? They'll be active during the special session and the 2018 Republican primaries — speaking their minds and casting their votes based on issues, not on political party. "We're distracted by party issues that don't matter," said Troy Reynolds, founder of Texans for Public Education, the grassroots Facebook-based activist group hosting the rally. "Any enemy of public education will only have our enmity and certainly not our votes." Gov. Greg Abbott has put several education-related bills on his wishlist for the upcoming summer special session, including a few recycled items the House and Senate could not agree on during the regular session, like school finance reform and private school choice for kids with disabilities, as well as a couple of new items such as increased pay for teachers. Teacher groups have called Abbott's proposal for a $1,000 pay raise for teachers an unfunded mandate because it would likely not come with additional state funding. Abbott said during his special session announcement that school districts could easily "spend smarter" in order to raise teacher pay. "We must do better to attract and retain quality teachers in our classrooms. I want that process to begin now," he said. "The pay increases could easily be achieved by passing laws that reprioritize how schools spend money." More than 20 school groups and districts sent a letter to Abbott, Patrick and House Speaker Joe Straus on Monday weighing in on the special session agenda and demanding more state funding be directed to public schools. They opposed state subsidies for private school tuition and urged any study on school finance reform to be tied to specific goals and outcomes. They also asked the Legislature not to pass a so-called "bathroom bill," regulating public bathroom use for transgender Texans. Last week, Lt. Gov. Dan Patrick called a press conference in which he didn't take up his major education priorities: subsidies for private school tuition or regulations on public bathroom use. Instead, he focused on teacher pay and school finance, proposing a plan to "reprioritize" existing state funds from the Texas Lottery to pay for teacher bonuses and retirement benefits. He also proposed having school districts "reallocate" money to increase teacher pay by 5 percent over the next five years. Teachers at the rally Monday booed at the mention of Patrick's plan. "A bonus is not a pay raise... Why not have the state pay for a real teacher pay raise?" asked Noel Candelaria, president of the Texas State Teachers Association. Disclosure: The Texas State Teachers Association has been a financial supporter of The Texas Tribune. A complete list of Tribune donors and sponsors can be viewed here.